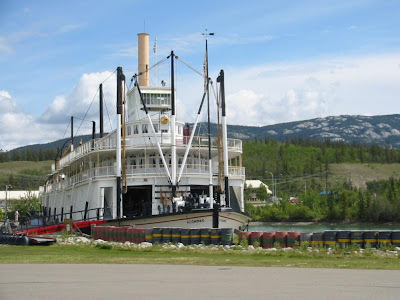 Originally we were going to re-visit Skagway and then come to Whitehorse. However between the web cam pictures of Skagway showing 5 cruise ships in port and emails from other RVer’s currently in Skagway, we decided to skip Skagway at least for now. We will be coming back this way when we leave Alaska in September so we may stop by then. Whitehorse is the capital of the Yukon, far and away the biggest city. Although it can boast to having 3 Starbucks and a Wal-Mart, it still is pretty small. Here is where you make the decision to go straight up to Tok, Alaska on the Alaska Highway or detour north to Dawson City. Dawson City was the center of the famous Klondike Gold Rush of 1898. We will be heading to Dawson City when we leave here in a few days. Fred and Jo have decided to head straight to Alaska. We will meet up again with them later in Alaska. Some people collect stamps and other people collect all manner of things. Kathy and I collect Microbrews. We try to sample the local Microbrews wherever we go. 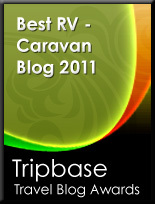 The only truly disappointing one we have found was the West Yellowstone Brewing Company in West Yellowstone, Montana. We tried three different kinds of their beer and would not go back for any of them. We enjoyed the Jasper Brewing Company and the Moab Brewing Company so much we went to each twice while visiting those areas. One of our first stops in Whitehorse was the Yukon Brewing Company. “Beer so good it is worth freezing for” is their motto. To our surprise this is just a brewery and not a brew pub, as most microbrews are. However they do free beer tasting. We left with a 12 pack of Yukon Red. Other things we did today were the Whitehorse Dam and fish ladder, Miles Canyon and toured the SS Klondike (Sternwheeler). The dam isn’t anything special and the salmon won’t be in the fish ladder until August, but it is amazing how they travel up more than 2,000 miles of the Yukon River to get here. Equally amazing is that the fish hatchery releases 150,000 baby salmon a year and they microchip every one of them before they are released. 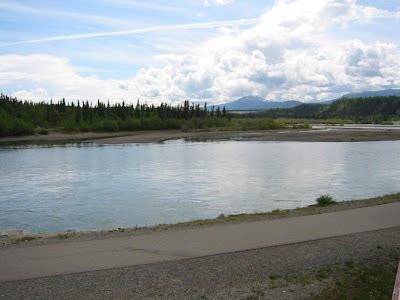 Miles Canyon was the most treacherous stretch of the Yukon River during the gold rush. Several gold rushers were killed here as the boats and rafts they built on Lake Bennett were smashed on the rocks. Today the passage is very narrow, but the rocks and white water are under water due to the Whitehorse Dam. Our experience at the SS Klondike was unique. 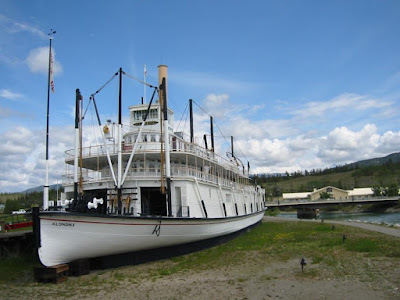 It is the last river boat to shuttle between Whitehorse and Dawson City. It stopped running in 1955 and has been restored by Parks Canada as a National Historic Park. Admission is by tour only; we took the 1:30 tour and were the only people on the tour. 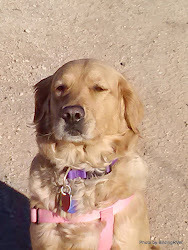 So, it was just Kathy, me and the park guide. The next two tours after us were each a tour bus load of people. The SS Klondike has been restored to its 1937 appearance; the guide was very knowledgeable and we found the tour fascinating. During the 1920s and 30s the price for second class passage was $25 dollars per person one way, which was one year’s wages for the typical Canadian at the time. The trips downstream to Dawson City took 36 hours, the trip up stream back to Whitehorse took 4 or 5 days. Each way the SS Klondike burned a cord of wood per hour!